The California Air Tools Ultra Quiet and Oil-Free Air Compressor is designed to be one of the quietest air compressors in the industry at a noise level of just 60 dB. The powerful 1.0 HP (SP-9413) motor operates at only 1,680 RPM, creating less noise and less wear. The new SP series of Ultra Quiet Air Compressor Motors has been designed to increase duty cycle and allow for longer continuous run times. The oil-free dual piston pump system is engineered for high performance and durability. This pump is designed to have a life cycle before wear of 3,000+ hours compared to other comparable air compressors with life cycles of 500 hours or less. The oil-free pump allows for use in a variety of temperatures and uneven terrains. The 7.6 L aluminum (rust-free) air tank is lightweight (35 lbs.) and very easy to transport. This air compressor is ideal for anyone working inside where noise is a major issue. Lightweight for easy transporting at just 35 lbs. The Campbell Hausfeld Air Compressor, 13-gallon Horizontal Oil-free (DC130010) is designed for the DIY enthusiast or weekend warrior. The compressor comes with an induction motor, designed for long product life. Its oil free design makes this air compressor low maintenance. With a max pressure of 150 PSI and delivery of 4 CFM @ 90 PSI, the DC130010 is perfect for a wide range of garage and workshop projects. The steel handle and large wheels are ideal for garage or shop portability. Finish your projects faster and easier with Campbell Hausfeld - The Air Power Expert. The DC200000 is designed for the DIY enthusiast or weekend warrior. The compressor comes with an induction motor designed for long product life. The robust shroud cover provides safety and protection from the running motor. Its oil free design makes this air compressor low maintenance which adds to the unit's longevity. Easy to use and read, the control panel offers complete control of air manipulation. The DC200000 features a rubber grip steel handle with pneumatic wheels, providing optimal portability. With a max pressure of 150 PSI and delivery of 4 CFM @ 90 PSI, the DC200000 is perfect for a wide range of garage and workshop projects including inflation, painting, bolting/tightening, stapling and nailing. Finish your projects faster and easier with Campbell Hausfeld - The Air Power Expert. The Campbell Hausfeld Air Compressor, 26-gallon Vertical Oil-free (DC260000) is designed for the DIY enthusiast or weekend warrior. The compressor comes with an induction motor, designed for long product life. Easy to use and read, the control panel offers complete control of air manipulation. Its oil free design makes this air compressor low maintenance making it hassle-free. This compressor includes a robust shroud which covers the pump and motor for safety during operation. With a max pressure of 150 PSI and delivery of 4 CFM @ 90 PSI, the DC260000 is perfect for a wide range of garage and workshop projects including inflation, painting, bolting, stapling and painting. The steel handle and large wheels are ideal for garage or shop portability while the vertical design saves space. Finish your projects faster and easier with Campbell Hausfeld - The Air Power Expert. The Hulk silent air compressors are designed to provide all power with little noise! The oil free, dual piston 2 cylinder pump with low amp draw and solid copper winding's allows for less wear and tear. These commercial grade pumps are designed with heavy gauge steel cylinders, cylinder head and valves for maximum durability and reliability. Providing 4.87 CFM @ 40 PSI and 3.14 @ 90 PSI and an amazing 36 DB @ 10 ft. 45 DB @ 3 ft. away! 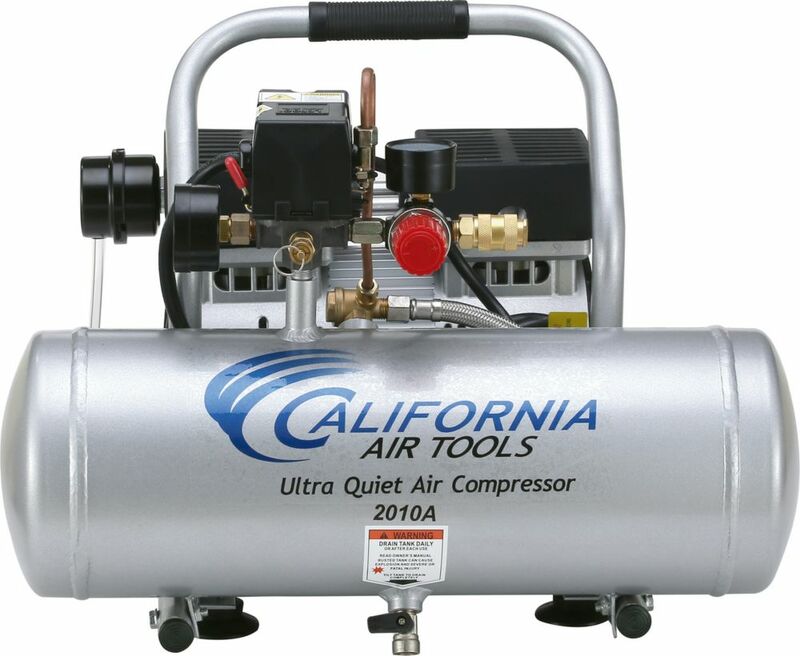 7.6 L 1.0 HP Ultra Quiet and Oil-Free Aluminum Tank Air Compressor The California Air Tools Ultra Quiet and Oil-Free Air Compressor is designed to be one of the quietest air compressors in the industry at a noise level of just 60 dB. The powerful 1.0 HP (SP-9413) motor operates at only 1,680 RPM, creating less noise and less wear. The new SP series of Ultra Quiet Air Compressor Motors has been designed to increase duty cycle and allow for longer continuous run times. The oil-free dual piston pump system is engineered for high performance and durability. This pump is designed to have a life cycle before wear of 3,000+ hours compared to other comparable air compressors with life cycles of 500 hours or less. The oil-free pump allows for use in a variety of temperatures and uneven terrains. The 7.6 L aluminum (rust-free) air tank is lightweight (35 lbs.) and very easy to transport. This air compressor is ideal for anyone working inside where noise is a major issue. 7.6 L 1.0 HP Ultra Quiet and Oil-Free Aluminum Tank Air Compressor is rated 4.7 out of 5 by 111. Rated 4 out of 5 by Thaddeus from Just what I was looking for. Small, light &... Just what I was looking for. Small, light & quiet. Perfect for blowing out sprinkler lines, filling tires, blowing out dust. Rated 5 out of 5 by Paul from I bought this compressor to conduct fossil preparation in a... I bought this compressor to conduct fossil preparation in a home environment. It’s very quiet, and the compressor doesn’t continually go on and off. I would recommend this to anyone using it indoors. The words “ultra quiet” are true. Congratulations to California Air Tools for getting it right.